Schedules and fares for the few ships that regularly travel between Cape Town and Tristan da Cunha. Scheduled ships run from from Cape Town to Tristan da Cunha and return. All but one are vessels provided by the fishing company Ovenstones which each carry only 12 passengers. Presently these vessels are the fishing vessels MFV Edinburgh and MFV Geo Searcher (which carries out extended fishing trips to the outer islands of Inaccessible, Nightingale and Gough in the fishing season), and the cargo ship MV Baltic Trader. The final trip is the annual Gough Island relief voyage, provided from 2012 by the South African Antarctic Research and Supply Vessel Agulhas II which calls at Tristan da Cunha on its outward and return voyage and carries over 40 passengers to Tristan (42 in 2014). Ships are booked many months in advance and you are advised to read carefully the 'Passenger Policy' below regarding priorities which may mean that berths may be cancelled at short notice. Check carefully the visits section to plan your Tristan da Cunha voyage with care! Find out more about the ships on our separate Ships Page. All ships carry mail, cargo and passengers. All dates are provisional and to be confirmed. 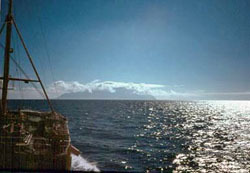 A journey to Tristan da Cunha is always by ship. The 2810 km or 1750 mile journey from Cape Town harbour will normally take six days. A landing after the passage depends on the weather, although the Agulhas normally flies passengers ashore immediately, except in severe weather conditions. All dates are provisional. 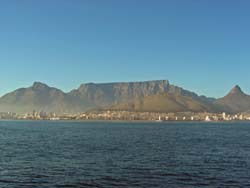 The Fair Cape: Tristan journeys start and end in the beautiful Table Bay Harbour Cape Town, South Africa. Long awaited: The world's most isolated community regards the arrival of every ship as a special occasion. (non priority) The Administrator certifies the need for an official to attend to Island business. If you are in category 4 to 8 above, you may be required to give up your booking and defer your travel to another sailing for those covered by category 1-3. Close family links are understood to refer to a passenger plus spouse and dependants who have parents, grandparents, children, sisters, brothers, aunts or uncles resident on Tristan.